Battleship slot machine from IGT is a 5-reel, 40 payline title that is based on the classic naval combat game invented during the first World War, originally as a pen and pencil game. The game has max jackpot of 1,500 coins per line, which with 40 lines isn’t too bad, and there is also a free spins bonus which awards random free spins with random multiplier. 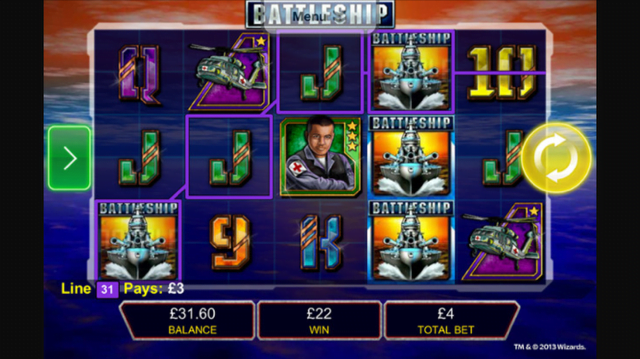 The full Battleship slot review is below, and there’s a bonus for you as well. If you remember the game of Battleship from your childhood, you’ll relish having the chance to climb aboard the iconic destroyer and blow the opposition to pieces in IGT slots’ Battleship slot. A five-reel, 40-payline title, the Battleship slot machine doesn’t actually have all that much in common with the classic game of naval strategy other than its theme, with battleships, captains, medics and fighter planes standing in for some of the slot’s higher value symbols. Available to play from just £0.01 per spin, the game offers a maximum regular jackpot of 1,500x and stacked wilds that double the value of wins. Also boasting a free spins feature in which bonus games, prize multipliers and instant cash awards can be accumulated, the game packs more prize punch than a surface-to-air missile and will certainly give players an appetite for destruction with its explosive animations and immersive sound effects. As mentioned above, the main bonus feature in the Battleship slot is a free spins game that is divided into two distinct segments. Triggered whenever three, four or five bonus scatter symbols appear anywhere on the gameboard, players will receive two, three or four missiles respectively and will then have to select as many ships to lock onto as they have available ammunition on a new screen. During this feature, each ship will be auto-targeted once by the game, with all successful hits revealing either a number of free spins, a prize multiplier or an instant win amount. When the auto-missiles and players’ manual rounds have all been fired, the cumulative number of free spins and multipliers will then be transferred into a bonus game, which continues until all spins are used up. During both free spins and the base game, all battleship symbols act also as substitute wilds and will also double the value of any regular payline they feature in so long as two or more are present. Although a decent slot in its own right, the Battleship slot lacks the charm of the game it’s based on and could have been a more engaging title if the grid warfare system had been added as a bonus round. Like the Battleship slot review? Check out these as well…..